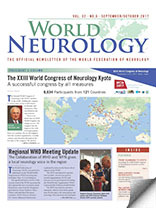 The World Federation of Neurology (WFN) was invited to participate in the World Health Organization (WHO) meeting that took place Sept. 11-14 in Budapest. 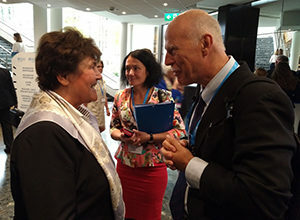 Regional Director Zsuzsanna Jakab (left) speaks with WFN Professor Wolfgang Grisold, WFN secretary general. The agenda included a review of the current work of the WHO, presented by the regional director, Zsuzsanna Jakab. Statements came from the Hungarian government (Prime Minister Viktor Orban) and individual European countries. 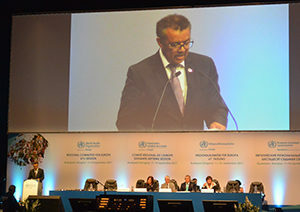 WHO Director General Dr. Tedros Adhanom Ghebreyesus explained his ideas on the future development of the WHO. The WFN was invited as a permanent member. Several non-governmental organizations (NGOs) and non-state actors participated, including the World Stroke Organization (WSO), represented by Professor Patrik Michel. WHO Director General Dr. Tedros Adhanom Ghebreyesus outlines his vision of the WHO during its regional meeting for Europe. The WFN was invited to provide a statement, which it chose from agenda item 5b referring to the environment and neurology. This statement was developed by using the work done by a WFN applied research group on neurology and the environment. This research group met in 2016 in Strasbourg and emphasized the importance of the environment and its effect on neurologic diseases. The final version of the report as accepted is posted at who.int/en/. The written statement has been posted at euro.who.int/en/about-us/governance/regional-committee-for-europe/67th-session/statements-from-non-state-actors. 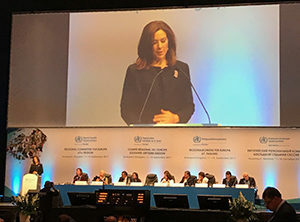 Crown Princess Mary of Denmark, the patron of WHO European region, speaks at the WHO Regional Committee for Europe. Also present were the WSO and several other NGOs with overlapping fields in neurology, such as palliative care, occupational therapy, and student representation (IFSMA). The cooperation of the WFN with the WHO is important and has included several successful projects, such as the Atlas of Neurology, the ICD-11 classification, and future work on non-communicable diseases. The WFN participating with the WHO in regional meetings is extremely important as it gives neurology a local voice in the important regional aspects of WHO work.